This framed menu is from the Queensland Railways Refreshment Rooms at Toowoomba Station. Menu from the Sydney Cafe, Nicholas Street, Ipswich, home of the mixed grill, displaying the dinner menu and light refreshments. A list of soda fountain flavours can be seen on the sign behind Vera Dawson and Maureen Sheppard, who were waitresses at Londy’s Café in Ipswich in the late 1940s and early 1950s. 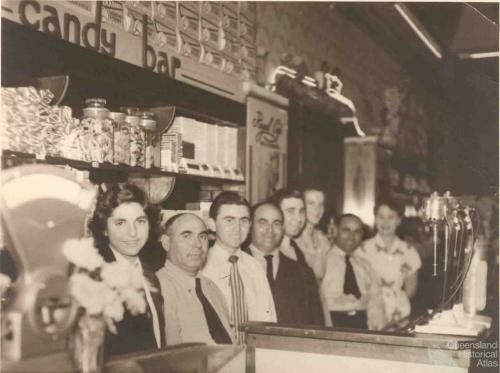 Milk bars boosted the trade in ice-cream, an American delicacy that was used in freshly-made sundaes, banana splits, waffles, parfaits, jelly, and fruit salad. 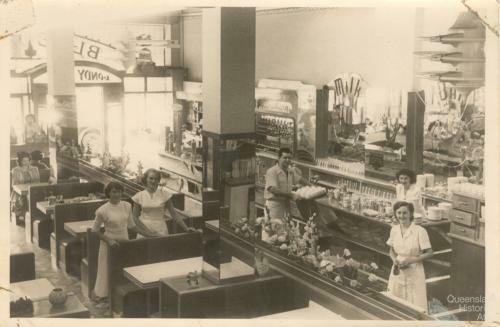 Many proprietors made their own ice cream until the World War II, when Peters Ice Cream, founded by an American in Sydney in 1907, dominated the market. Hamburgers were introduced through the US military forces in the 1940s and were popular in Greek snack bars. 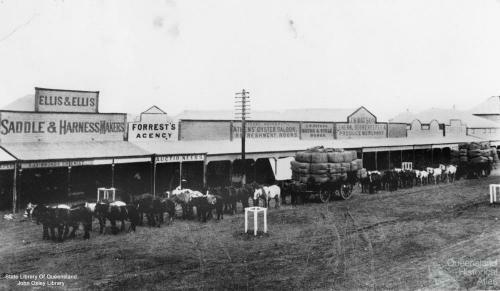 And while Australian lollies like Fantales and Minties were especially popular at cafés near picture theatres, the Candy Bar and American candies such as Cowboy Chews and Texas Chews betray the influence of the American candy store.